For being a completely renovated unit, the Pistons had plenty of moments in the season opener against the Wizards that reminded of last year. Turning the ball over on the first three possessions proved an inauspicious start, reminding many of the error-prone leadership of Brandon Knight. The first quarter was a jumbled mess of poor spacing and incoherent schemes. The defense made Trevor Ariza look like a first-team all NBAer. And then, as the team started to get stops and push the ball in transition, looks started to open up. Shooters were knocking down shots on fast breaks. The Pistons' oversized frontcourt started sharing the ball with pinpoint precision, finding countless open dunks. And for the first time since Chauncey Billups was traded away years ago, the Pistons looked like a team that could strike fear into a legitimate NBA title contender. That's not to say that this iteration of the Pistons is complete. Aside from the early-game struggles, bad habits cropped up throughout the game. At one point, John Wall clearly got in Will Bynum's head, encouraging him to shrug off Andre Drummond screens and throw up contested, long two-pointers on back-to-back possessions (he was pulled at the next whistle). And mid-way through the second half, the Pistons hit the No Go-To Player rut that typified last season until Kyle Singler went strong to the rim and drew an and-one. This team is a work in progress, one that won't be sorted out for many months. Eventually, Brandon Jennings will return and shake up the team's chemistry; there are real questions about whether or not he can consistently run the team as fluidly as Bynum does (for all of his faults, he continues to distribute well and get the offense churning). Hints of last season's ineptitude still seep through the cracks from time-to-time, and the Drummond/Monroe/Smith frontcourt, though showing impressive chemistry, is yet to prove they can do it against more competent teams. But for now, the Pistons finally look like a team that will contend for a playoff spot and surprise some teams that aren't ready for their constant attack. Greg Monroe. The story of last night was Monroe's improved efficiency: 24 points on 15 shots, 12-15 from the free throw line, and 16 rebounds. Monroe found his way to the charity stripe time and again, but still struggled from the field, connecting on only 6 of his 15 shots. This kind of performance may not be sustainable. Getting to the line has never been his strong suit (though, Coach Sheed may have fixed his stroke), and those 16 rebounds are less about his acumen and more due to the boards bouncing his way--there will be plenty of games where those careen to Drummond instead. But Monroe took care of business and looked generally improved from last season. Drummond sitting during crunch time. Drummond only charted 26 minutes last night and didn't see the floor in crunch time. He sat next to Mo Cheeks and stood up after every whistle, hoping to get back into the game. But Cheeks opted to go with Kyle Singler and spread the floor, ultimately a good decision. Drummond's lack of late-game playing time may have been an avoidance of hack-a-Drummond schemes or an admission that the Pistons needed to spread the floor to score consistently, but I hope this doesn't become a trend. Drummond is too valuable to the organization to spend large swaths of time on the bench. Kentavious Caldwell-Pope rounding into shape. I remain encouraged by KCP's play. Though he shot only 4-12 from the field (and 0-3 from outside), his game is fluidly translating to the NBA environment. He put the ball on the floor a number of times and attacked the rim, sometimes with reckless abandon, picking up two charging fouls. His threes were also generally on line but just long, clanging off the back rim. That's the sign of someone who is mechanically sound but just not getting the bounces. That will change. He continued his preseason streak of having an assist and a steal (two of each in this contest) and pulled down only one rebound in his 27 minutes. He was overzealous on a few defensive plays, opening up back cuts when he tried to jump a passing route, but a solid game from the Pistons' first-round pick. Chauncey Billups can still shoot update. Yep. Rotation. Cheeks went with a short bench, playing only eight men throughout the game. KCP was the first off the bench, replacing Will Bynum, which moved Billups to PG. The versatility of this lineup was evident the entire game. Monroe played center and PF; Smith, SF and PF; Billups, PG and SG; and KCP and Singler, SG and SF. Much of this is out of necessity--the Pistons need floor spacers to complement their frontcourt--but that the team is able to be this flexible, both with size and skillset, will be an valuable attribute during the season. When Jennings returns, some of this will be mitigated, but the roster finally has the pieces to create matchup problems. Trevor Ariza. 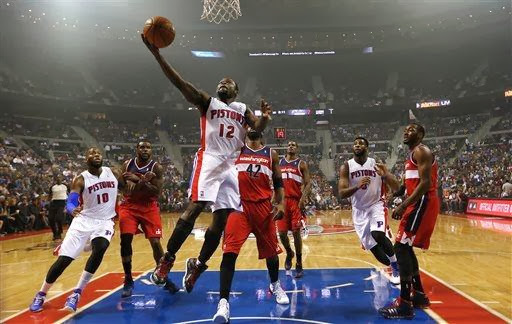 Ariza's explosion was no fluke and points to some of the issues with the Pistons' froncourt. Smith or Monroe was matched up on Ariza during the first quarter, something he was able to exploit with his speed. Smith is a great perimeter defender but was lost a few times in the half court and didn't make attempts to recover quickly. When Monroe was switched onto Ariza throughout the game, it became a clear athleticism mismatch. The Pistons will need to find ways to limit these situations throughout the season or more small forwards will hurt the team. Tomorrow night, the Pistons travel to Memphis in what is sure to be a grinding frontcourt mess. Watching the Pistons' bigs battle the talented frontcourt of Memphis should be fun. Memphis is coming off of a road loss to the Spurs last night and will be playing their first game at home this season.